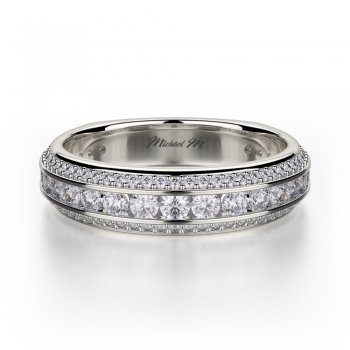 Timeless and sophisticated, Michael M channel set diamond wedding bands are an extremely popular bridal jewelry option amongst fashion-forward celebrities and everyday people, alike. Defined as any wedding band featuring sparkling diamonds that are carefully placed in-between two strips of gleaming precious metal, a channel wedding band from Michael M is an amazing way to celebrate the eternal love and commitment shared between two individuals. Not only beautiful, channel set weddings are a fabulous choice for today’s active brides, as its unique construction makes losing or damaging the piece’s diamond stones close to impossible. Available today in models made with 18-karat white gold, yellow gold, rose gold, as well as 950 platinum, Michael M channel wedding bands can only be found at authorized retailers, ensuring that every piece purchased is 100% authentic, in amazing condition, and up to Michael M’s high jewelry making standards. With precisely crafted edges and skillfully-placed diamonds, the channel set diamond wedding bands are the ideal complement for brides-to-be of all tastes and individual fashion preferences. Available now at Michael M retailers are channel wedding bands that range from demure and delicate, such as the subtle R461SB and R461-B1 models, to pieces like the R396BS and the R396B bands that are truly extraordinary and bold. Also, the artisans at Michael M are proud to offer other Michael M channel wedding bands featuring rows of round and princess shaped diamonds. Placed half-way around the ring, the multi-rowed Michael M R401B and R656B combine innovative designs with an unbeatable diamond shine to create a channel set wedding band that is truly out of this world. 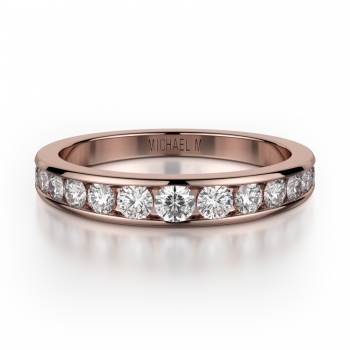 Truly more than the sum of their parts, the engagement rings, wedding bands, and fine jewelry pieces of Michael M are some of the most inventive and exquisite items available today. Handmade in their legendary California workshop, every piece of Michael M bridal or fine jewelry is the product of hours-upon-hours of individualized attention from one of Michael M’s expertly-trained jewelry making professionals. It is this commitment to quality that has come to define Michael M, and is why every piece is sure to bring more than a lifetime of enjoyment and satisfaction to you and your special someone. For more information on Michael M designer jewelry, please visit the “Retail Locater” page at michaelmcollection.com to find the nearest authorized Michael M retailer nearest you!